Diamonds today symbolise everlasting love, a gemstone highly prized in many cultures often given as a promise prior to the union of lovers. However, beyond its undeniable allure, the Diamond’s past is rife with controversy. In this guide, we’ll take a closer look at the Diamond’s rich and complex history, from its roots as an ornamental gemstone to its emergence as a symbol of love and fidelity. As one of the most coveted gemstones—alongside sapphires, rubies, and emeralds—we’ll also discuss how to pick the right stone for you. Let’s start then with a little bit of science. Known as the hardest natural substance on earth (a 10 on the Mohs gem hardness scale), Diamonds are made up of pure carbon arranged in a crystal structure called Diamond cubic. Most of the Diamonds today are 1 billion to 3.5 billion years old, formed in the Earth’s mantle at 150 to 250 kilometres deep. They are found in kimberlite rocks or alluvial deposits. Raw Diamond in kimberlite rock. Due to its carbon makeup (a rigid arrangement of atoms), only a few types of impurities can penetrate it (unlike the other precious gemstones). When this happens, coloured Diamonds are born. For instance, boron turns Diamonds blue, while nitrogen turns them yellow. Other Diamond colours are pink, green, purple, red, and orange. 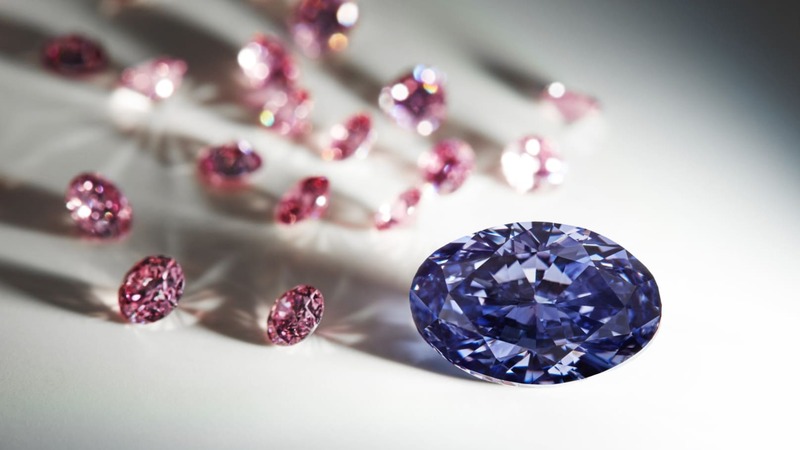 Coloured Diamonds are even rarer than clear Diamonds, which makes them even more expensive and sought after. Diamonds are formed when high temperatures and pressures in the upper part of the Earth’s mantle cause fluids that are rich in methane and carbon dioxide to decay to pure carbon. This process then releases free atoms which form the stable Diamond. Deep-source volcanic eruptions then allow Diamonds to eventually make their way up nearer to the Earth’s surface. There are other processes through which Diamonds are formed, including subduction zones, impact sites from asteroids, and even formation in space (yes that’s right, some Diamonds may quite literally be extraterrestrial). More than its rarity and aesthetic appeal, these glimmering glass-like native minerals are also extremely useful. While decorative gem-quality Diamonds are characterised by the four Cs— carat, cut, colour and clarity—these are irrelevant in the face of the incredible features of industrial-quality Diamonds. Diamonds are chemically resistant and exceptionally hard. In fact, apart from being the hardest known natural substance, it also has the highest thermal conductivity. This has made them ideal for use in industrial processes, including cutting, polishing, and even wearing away other Diamonds. They are often used in industrial Diamond-tipped drill bits and saws, while Diamond powder is used as an effective abrasive. India is the birthplace of the Diamond, and for centuries it was believed to be the only place it could be mined—that is until a small deposit was found in Brazil. 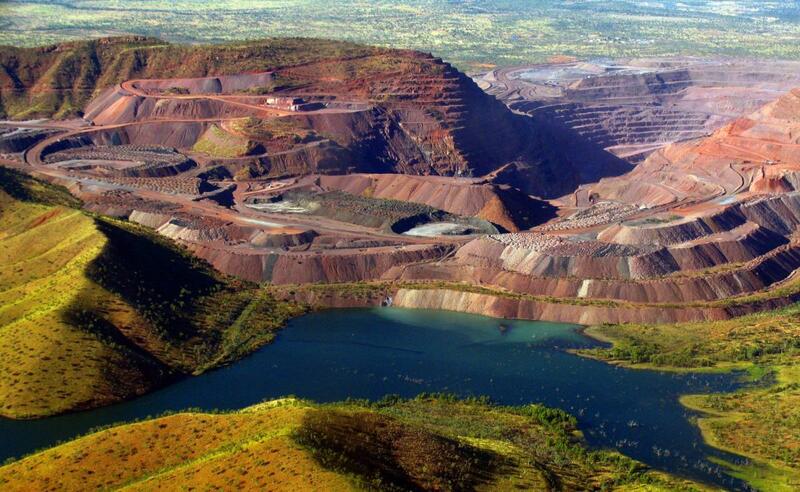 Argyle Diamond mine in Western Australia. As of 2017, the annual production of Diamonds throughout the world was believed to be over 177 million carats. However, Diamond production is gradually going down due to mining reserves drying up and no new mines in sight. People have been using Diamonds as ornaments for tens of thousands of years. In fact, the earliest recorded use of Diamonds or a similar mineral by humans is between 25,000 and 30,000 BC. The first Diamonds were discovered in India in the 4th century BC. These were then transported to China via the Silk Road, and were used as adornments, cutting tools, and talismans against evil. In the Dark Ages, these gemstones were believed to heal certain ailments when ingested. Although originally prized for its ornamental qualities, people soon discovered that a Diamond also had industrial uses due to its hardness and strength. In fact, the word “Diamond” came fromthe ancient Greek word “adamas”, which means invincible, untamed, or indestructible. When the Indian Diamond mines were depleted, even the small deposit found in Brazil in 1725 wasn’t enough to supply global demand. The Kimberley Diamond Mines in South Africa. 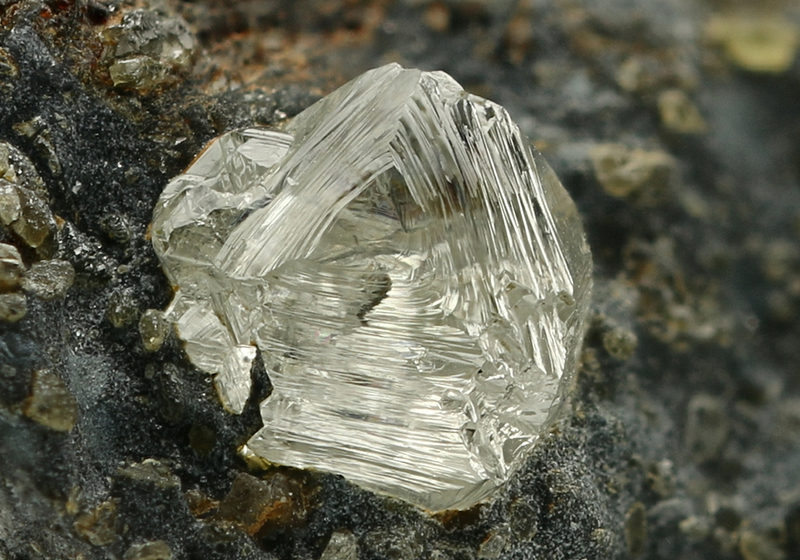 In the late 1800s, a new Diamond deposit was discovered in Colesberg Kopje, South Africa. This, later on, became known as the Kimberley Diamond Mine, a large-scale mining operation established by the De Beers Consolidated Mines, Ltd.
De Beers was able to successfully control the world’s Diamond supply from South Africa, but it significantly decreased the Diamond’s rarity to as much as 50%. At this point in history, Emeralds, Rubies, and Sapphires were more valuable than Diamonds. De Beers and NW Ayer’s ad for Diamonds, which catapulted the gemstone’s status as a must-have for engagement rings. 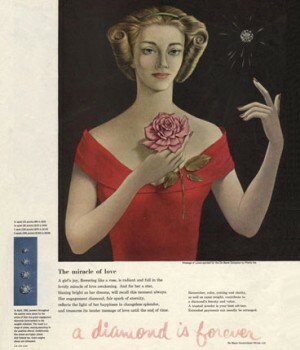 It wasn’t until 1947 when DeBeers and advertising agency N.W. Ayer created the tagline “A Diamond is Forever”, that the Diamond’s resurgence as a valuable gem began. The company launched numerous, widely successful high-profile advertising campaigns that linked Diamonds with engagement rings. The Diamond soon became a symbol of status and a vital part of modern betrothals. Jeweller’s experimented to improve a Diamond’s look, which gave rise to various cuts like round, oval, square, rectangular, and marquise. Elizabeth Taylor’s 33-carat Asscher cut Krupp Diamond engagement ring. In terms of the most expensive celebrity engagement rings, at the top of the list is the late film star Elizabeth Taylor’s engagement ring. This exquisite ring featured the Elizabeth Taylor Diamond, a near-flawless 33-carat Asscher cut Diamond (originally known as the Krupp Diamond). It was given to the actor by Richard Burton in 1968 and she wore it all of her life until it sold for $8.8 million at Christie’s after her death in 2011. One of the most expensive Diamond engagement rings in the world today is believed to be the Pink Star, a 59-carat oval cut fancy vivid pink Diamond believed to be internally flawless and worth over $73 million. Despite its wide ornamental and industrial use, there is a significant shadow hanging over the Diamond industry. Due to its high value, Diamonds occasionally have been the driving force behind notable periods of blood Diamond mining, as well as slave and child labour in the past. Proceeds from the sales of Diamonds have sometimes been used to fuel violent conflicts, most of them in Africa, and support human rights abuses by revolutionary groups and dictators. Type IA – Around 95% of all Diamonds are Type IA, which absorb blue light to appear almost colourless or pale yellow. Type IIB – Among the rarest Diamonds in the world, these light blue or grey Diamonds are extremely valuable. Why are Diamonds such a good choice for engagement rings? There are a couple of obvious reasons, the first being that the stone lasts forever – a fitting symbol for eternal love. Diamonds are also extremely valuable, thereby bestowing the lucky recipient with a sense that he or she is really worth a few month’s wages. Cut — This is the most important factor, as the cut greatly influences the Diamond’s sparkle. Even if it has the highest colour grade, the wrong cut would degrade a Diamond’s value. The most famous cut for modern Diamond engagement rings is the round brilliant, making up 60% of the market. Colour — A Diamond that is colourless has the highest grade, which makes it more valuable. Clarity — This refers to the imperfections and blemishes on Diamonds. This is the least important factor as often, these flaws (called “inclusions”) are microscopic by nature and doesn’t affect the Diamond’s beauty. Carat — This refers to the Diamond’s weight, not its size. Consider carat with the Diamond cut, as a stone with a poor cut can appear smaller. When cleaning your Diamond jewellery, avoid using harmful solutions. Use soft material so as to not damage the stone or loosen the prongs. Keep your Diamond jewellery away from other pieces (e.g. in a compartmentalised case) to avoid scratching. If you liked this article, you can find out all about the history of the engagement ring in our previous blog post. If you’re looking to pop the question with a Diamond yourself, then check out Lillicoco’s stunning collection of vintage and antique engagement rings.